Ilima Todd, YA author: I survived! I read it this morning - you did an awesome job! I'm heading over now, but I'm sure you did great. *applause* or rather *standing ovation*!!! Good for you!! Nice job. 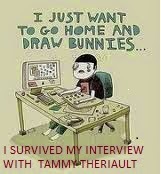 Tammy's interviews are crazy. Have to check it out when I can. I love I'm Small by Phantogram. LOL! It is quite an accomplishment to survive! Heading over right now! Haha, glad you're still with us. Off to check out the interview - I'm sure you did great! I really enjoyed reading that! What fun!